October 31st Mascarada Puppet Days : The Tico Hallowen day. Costa Ricans don’t celebrate Halloween as Familiar but we adopted this day almost exclusively in places where there are lots of foreigners , this is a great opportutity for Local bars and Hotel to attract customers during the low tourism season with costumed parties. 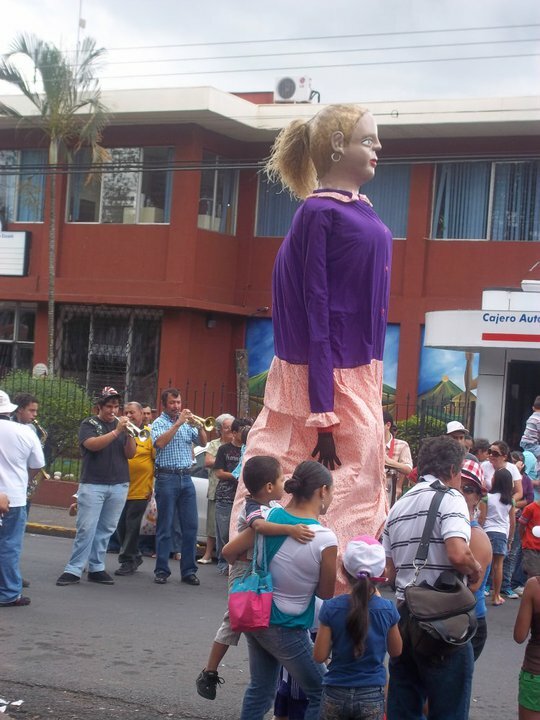 This is Capitalist Celebreation…I invite you to Celebrate with your family and friends a very nice Tico tradition : Mascaradas Puppets Day on October 31 st.
La Mascarada is a parade of giant masked figures. This tradition is originated as an adaption of Carnival. The Spaniards brought their costumed holiday, Carnival, and its masquerade dances to Central America. 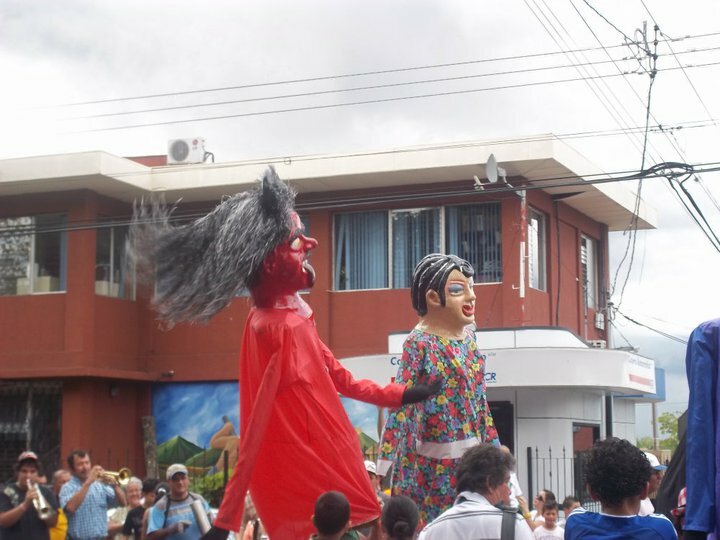 This cultural traditions had begun to fade away until 1996 when the Ministry of culture decided to establish an annual parade called the Dia de la Mascarada Tradicional Costarricense. 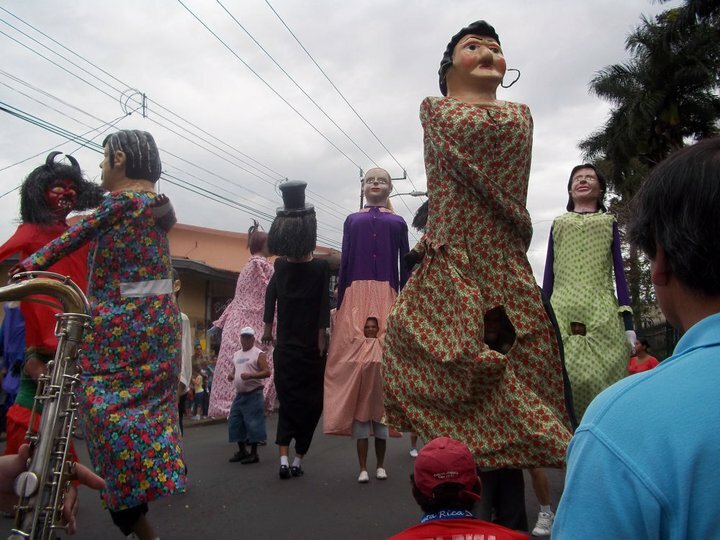 Parades celebrating this day are held throughout the country with many people wearing their large masks and dancing. Everyone danced with the puppets joining in. Kids enjoy it more than anybody.The music is provided by groups of musicians called Cimarronas-band of traditional Costa Rica Music. These bands have been an important part of all Costa Rican celebrations for years. The name comes from the Spanish word for wild, cimarrón, and was originally used to refer to the band made up of self-taught musicians. Heads are made with craft paper and newspapers with glue and Skilled by local artisans that spend weeks preparing the masquerade costumes. 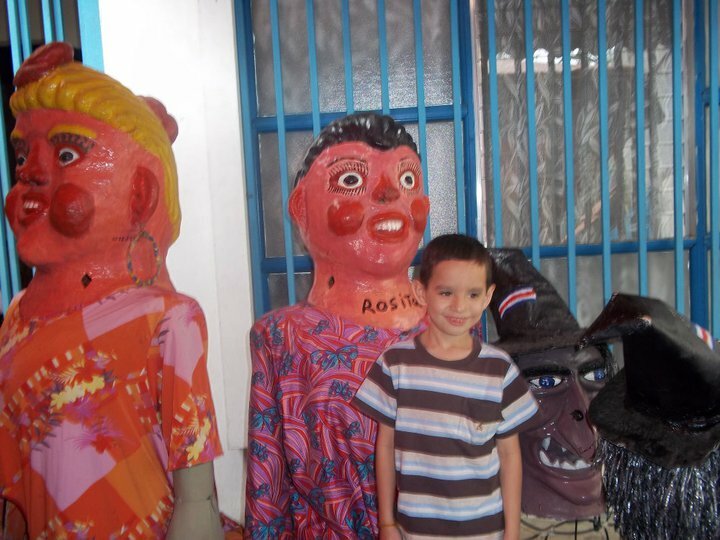 They are shaped and painted to look like characters from stories told long ago in the Costa Rican tradition or some funny character like El Diablo, la Muerte, la Segua, la Llorona, la Giganta, el Polizonte, la Chingoleta, el Padre sin Cabeza and others. Very nice tradition and good alternative to Halloween. Who create this puppets – special arizans or amateurs?